If given the chance, we all like to think we'd travel the world for a living, but rarely do we ever meet a person who actually does it and loves it as much as many of us dream we would. This is part of why it was such a pleasure to speak with the hyper-creative Lourdes Hernández, a Madrid-born indie singer-songwriter who goes by the stage name Russian Red (yes, like the shade of MAC lipstick) and is known far and wide as "the Feist of Spain." 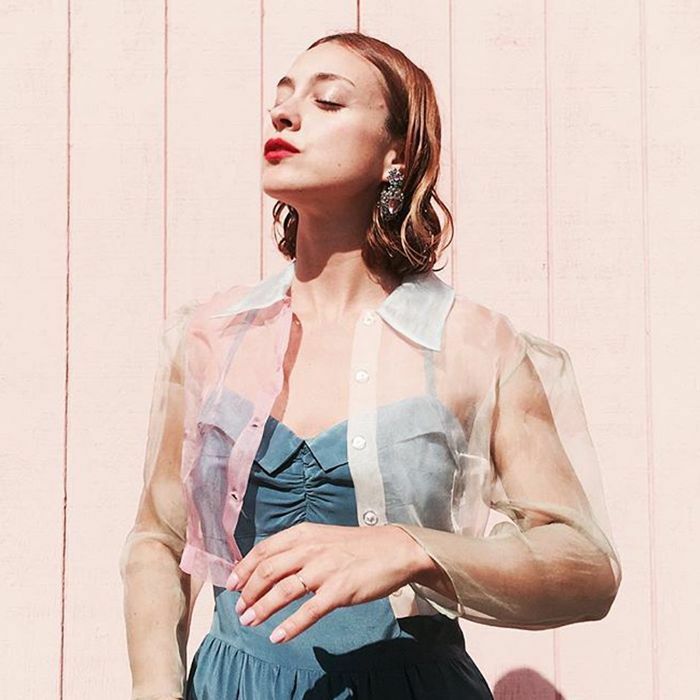 A quick listen to any of Hernández's folky, atmospheric pop singles (I recommend starting with "I Hate You But I Love You") or swipe through her delicately curated pastel Instagram account, and you'll find evidence of a woman in motion. Whether it's her place of residence (Hernández moved from Spain to Los Angeles five years ago and continues to fall deeper in love with it every day, though she's also constantly touring and performing across the globe), her musical style, or her beauty look, the 32-year-old refuses to stay in one place. "I like to try new things," she tells me of her attitude toward beauty trends, though I have a feeling this applies to the rest of her life as well. "It doesn't always work, but sometimes it does." Hernández's playful, experimental spirit and fundamental love of beauty (after all, she named herself after a lipstick) perfectly embody Byrdie's April theme, Freestyle Beauty, so our conversation with the musician came at the perfect time. To learn more about the beauty innovator's signature look, beauty inspirations, and secret skincare weapon when she's on tour, just keep reading. Does your skin ever freak out on you when you’re constantly on tour? And if so, how do you deal with it? It’s hard when you’re traveling a lot, especially on planes, because your skin gets really dehydrated. And then you’re eating whatever you can grab because you’re always tired and hungry. All that tends to be really bad for the skin and are two big things that concern me about touring. So first, I drink a lot of water. And every time I get to a hotel, I put a warm towel over my face. For some reason, and I don’t know if it’s real or in my head, it helps my skin look a little more moist. It just relaxes me. Then, I put on some natural oils. I use Isun oils. Have you heard of them? There are a bunch of different places in Silver Lake [in Los Angeles] that sell them. They’re really nice, super natural. I combine the exfoliant ($40), which has an enzyme that makes your skin a little tingly. And then on top, I use a goji mask ($42). I let that do its thing, I take it off, and put an oil on after—I’ve used all of the Isun ones individually, but there’s one called the Restore Oil ($92). It’s a little more expensive, but I love it. It’s incredible. Especially if you’re traveling, on the plane and your skin is really dry. I just use that, and it’s like having a new face. It works every time—it’s so great. You have the coolest beauty vibe. Who or what inspired you or helped shape your beauty look? Oh, my eye shadow in that photo is actually a liquid lipstick! Oh, cool! Yeah, it just looked so fresh, like a different texture, you could tell. Good job, haha. So just like that: I see things that I think are cool on people, ask them what it is, and I get it. It’s funny because the name of my band is Russian Red, like the lipstick color by MAC. And it literally was me being 19 at a party and seeing this girl across the room with this really amazing red lip. And I just came up to her and said, “What are you wearing? It looks incredible.” And she said Russian Red by MAC. And it changed everything for me. It was the first red lipstick I ever wore and felt cool about. Makeup is very personal. You can try things that you see on other people that you think look cool, but one day you find the thing that’s your thing. And I think clean skin and a red lip is very much my thing. I love the idea that you can experiment with different looks but always rely on clean skin and a red lip as your uniform. Do you have any advice for other people still figuring out what their go-to look is? You just have to make an effort to try out things that you like, even if they’re different. That’s basically what I do. I’m not even a big makeup person. But I’ve become a lot more playful since I’ve moved here [to L.A.] because I see girls having so much fun with it, and I think, that’s so cool and want to do that more. I feel like in Spain, the relationship with makeup is a little different. I think people use makeup less, in general, or they have less. Although I guess anything that’s trending here is trending in Spain, which is cool, in a way, because the world is more connected than ever, but less distinct, too. But I guess my advice would just be to try something that you see and that you like, see if it makes you feel cool, and that’s pretty much it, right? That’s what makeup is. Something to make you feel good. If you try different things, eventually you’ll find it. Have you experimented with anything new as of late? Yeah, I have, because there are all these Glossier billboards around L.A. They seem like they’re not wearing makeup, just like they have a filter on. So I did a whole order a couple of weeks ago, and I’m really digging the glittery eye shadow and also the Haloscope highlighter ($22). I love that stuff. Really into it. One last question: Aside from Russian Red, what are your ride-or-die red lipsticks? I really like Ruby Woo ($19) from MAC as well, because it's a little more upbeat than Russian Red. And Glossier has a red lipstick ($18) that's really mellow and nice. Those are the two I'm using if not Russian Red. The moment our conversation was finished and I bid Hernández farewell, all I wanted to do was go home and put on my favorite red lipstick. But that's the fun of getting to talk to another beauty adventurer—you're never short of inspiration.